Schantz Maker Monday Welcomes ALL Makers! How do our classes get started? Who decides what workshop we do next? Where can you get ideas or help for your own ‘maker’ project? 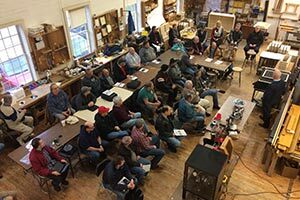 Our community comes together on the third Monday of every month for a FREE event we call Maker Monday…and you’re invited! enjoy a feature presentation on a number of different maker projects or businesses from our local makers. No need to register to attend! We welcome anyone in the community wanting to learn more, get inspired or start making.